One of the fantastic birthday gifts I received this year was an awesome board game called “Mr. 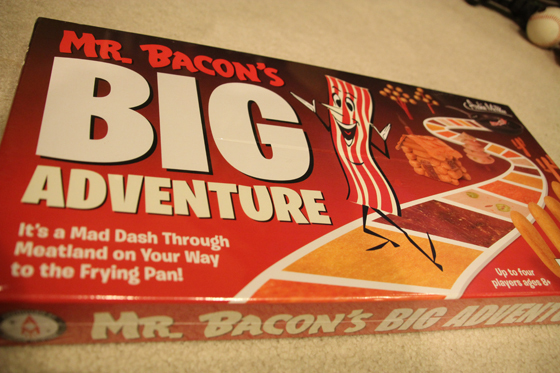 Bacon’s Big Adventure” – it’s similar to Candy Land, but even better – it’s about MEAT. Tonight, we cracked this game open and sunk our teeth in. 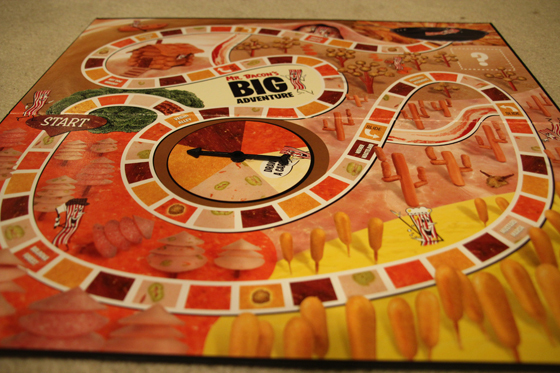 The board is hilarious and awesome – as you travel through Meatland, you have to navigate through the Bologna Forest, the Mustard Marsh, the Meatball Meadows, the Weiner Wasteland, the Hot Dog Hideout, the Sausage Sea, and the Gristle Grotto. There are also two “bacon slides” that can help you advance, or send you backwards. 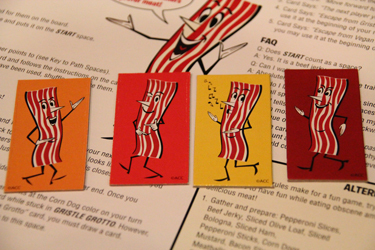 There are four meat treats that make up the squares on the board – pepperoni, corn dog, beef jerky, and olive loaf – and you choose one of four Mr. Bacons to help to the frying pan. 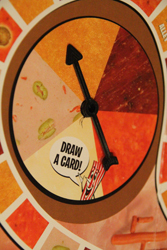 Along with the four meat treats, there’s a fifth spot on the spinner that is the “Draw a Card” spot – the game has hilarious chance cards that can really help you, or really, really hurt you – like getting sent to Vegan Alley, where the spaces are veggie fare like carrot, vegan corn dog, soy burger, and tofu. As simple as this game is, it was super fun to play. The chance cards really switch up the game, and the names for the different sections of Meatland are just so funny. 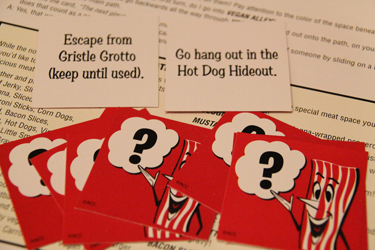 I got the “Go to Gristle Grotto” card which is good and bad – it’s close to the finish, but you get “stuck” there until you spin a specific meat treat on the spinner … but I also was lucky enough to get the “Escape from Gristle Grotto” card. I thought I had it made when I got there … but then before I could win the game, Nick got a “Switch Places with Any Player” card and stole my spot! 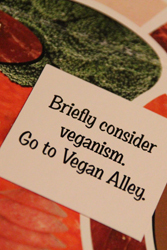 I went back almost all the way to Vegan Alley, and he won the game! There are also fun party rules that involve preparing lots of different munchies and eating them whenever certain things happen in the game. We may try that … but I might have to sub something out for that olive loaf … blech! If you love bacon, or know someone who does, I’d highly recommend this game. It’s clever, cute, and deliciously fun.